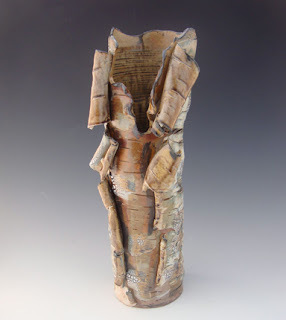 I had to search deep down into the Google listing and adjust my terms to find stunning examples of handcrafted ceramics that are inspired by the natural beauty of birch bark. There are an over abundance of tacky items created with birch bark as well so it took more patience but it was worth it. I found some exceptional examples. First is the work of Lenni Lampi at Birch Pottery. 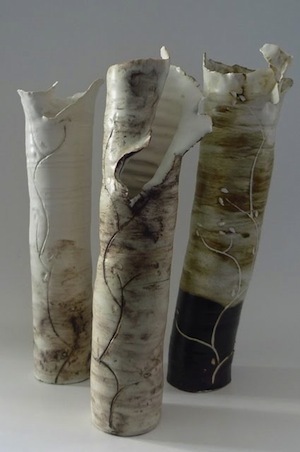 The work captures the texture and sculptural aspects of a peeling birch tree. The pieces are created by combining a variety of wheel thrown and hand building techniques. 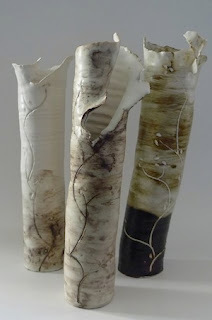 Visit the Birch Pottery website to see many more examples. The work is available for sale through her Etsy Site or through the Artful Home website. I was also impressed with the clay work of Sonia Sehil especially her bark series. She works in a cooperative clay studio called Clayspace in Brooklyn, NY and also has a shop on Etsy although there currently aren't any bark pieces shown there. In a totally different vein is the work of Liu Qingyuan displayed on the online gallery of Galleria Pangea. 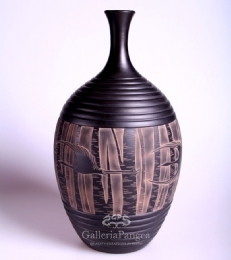 This is classic wheel thrown black pottery onto which the artist adds a contemporary birch inspired design. 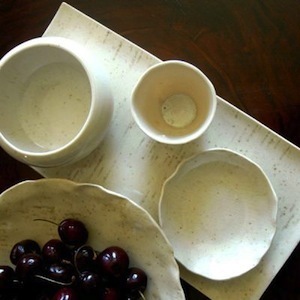 And finally here is a hand-built pottery collection by dbOHome that uses impressions of birch bark to create a subtle texture in porcelain. This is another natural theme that one could selectively scatter through a home to add continuity of design.